You can canoe on rivers of Raudna, Halliste, Navesti, Pärnu or Reiu. You can also choose between different trip lengths - from 15 up to 23 km, depending on whether you want to have an active rest or just enjoy beautiful nature. 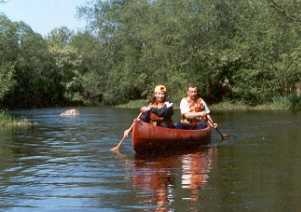 Raudna, Halliste and Navesti rivers on the territory of Soomaa National Park are mostly with low riverbanks and slow current. Pärnu river is the longest river in Estonia. Mostly wide enough also. With versatile riverbanks and many dam ruins and small rapids Pärnu River can offer you many alternations. It also has the advantage that it can be canoed on in spring and summer when smaller rivers aren't boatable because of low water level. Reiu River is a small affluent of Pärnu River. As it's curvy enough and also has alternating riverbanks, it's interesting to canoe in spring.